Wild: Despite being one of the Island’s larger creatures, Diplodocus Insulaprincep is among the Island’s smaller sauropods. Instead of the size and intelligence, Diplodocus developed faster maximum speed and greater endurance. When fully matured, it generally only reaches about two-thirds the size of the rather enormous Brontosaurus. Domesticated: Due to Diplodocus’ smaller frame, it cannot support the type of ‘platform’ saddle that other large creatures can. To make up for this, many tribes instead use a three-seater passenger saddle that allows Diplodocus to carry two additional riders. These passengers often use ranged weapons to protect the creature, or to attack nearby enemies while on the move! Known Information: Diplodocus is another creature whose continued survival on the Island confuses me. It’s a very thick-headed and trusting animal, often to its fatal detriment. It usually doesn’t flee from predators until after they’ve attacked it repeatedly, preferring instead to make numerous fruitless attempts at friendship. For some strange reason, Diplodocus trusts humans so much that it doesn’t seem to fight back against them… ever! The first thing the dossier talks about is the Diploducus’ weird reaction to attacks. Instead of fighting back or fleeing, it just lets the attacks happen and might flee from a predator if it is attacked multiple times (if it’s still possible by then). In case of humans, it doesn’t fight back at all. 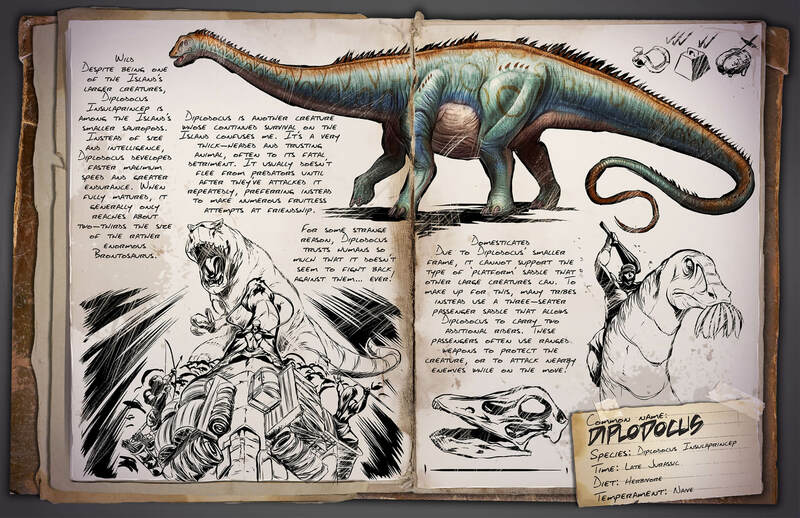 Furthermore, there will be no saddle platform for the Diplodocus according to the dossier, instead it will have a big saddle which can hold 3 people! This means that one person can ride the Diplodocus, while the other two can scout or even attack other dinos / players with the weapons they can carry. This isn’t the first time a creature is announced that can carry more than one person at a time: the Procoptodon will be able to carry a second person in its pouch. Gallimimus can hold three people, so it would not surprise me if the release of this fella was delayed or cancelle.